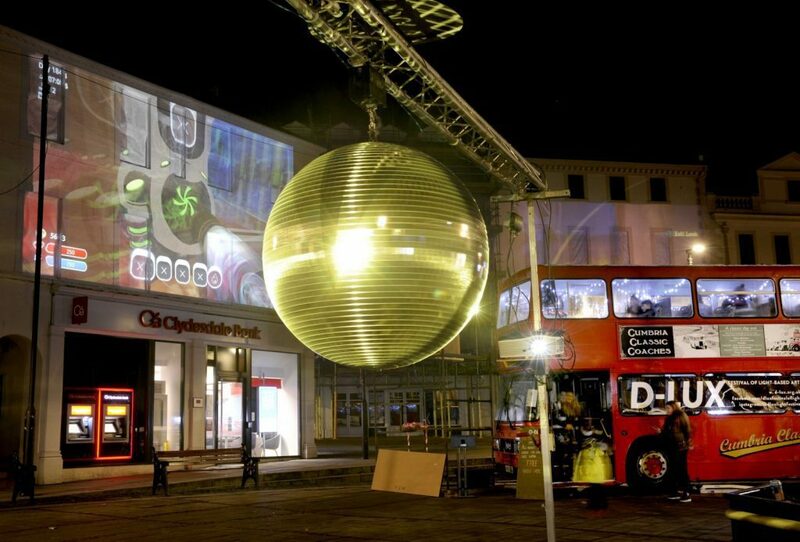 The third annual D-Lux Festival of Light burst into life last weekend when video games broke free from household screens and consoles and onto the streets of Dumfries. This year’s after dark festival, which was free and ran from 31 January to 2 February took place at a variety of locations, put the spotlight on the gaming industry and makes innovative use of interactive digital storytelling. It included the chance to board a double decker bus to play much-loved retro games at massive scale – projected on to the sides of buildings. Elsewhere D-Lux will had Mega Joy, a retro space shoot-em-up, with Scotland’ largest joystick controller. The festival also had a 60-hour live streamed charity gaming marathon plus talks, insights and live commentary, hosted by young people from Blueprint100, which is part of The Stove Network. David Smith, Creative Producer of D-LUX, said:“This year’s D-Lux celebrated gaming culture and brings it out of the house, off the screen, and onto the High Street. “The games industry is one where Scotland excels, bringing fun and excitement to audiences that are bigger than any hit movie attracts. D-Lux visitors played games themselves, or just wandered through the town and enjoyed the spectacle. They also enjoyed everything from games that are adrenaline-fuelled white-knuckle rides, to role-play set in the staggering beauty of distant galaxies, or the opportunity to create alternative digital societies. Part of the idea was to encourage young people to think about opportunities that might be available in the gaming industry. For 2019, D-LUX is funded by The Holywood Trust, Jardine Funeral Directors and match funded by Arts & Business for the third year in a row. Mark Jardine of Jardine Funeral Directors, who said: “I am once again very keen to support D-Lux in this highly innovative approach to boosting Dumfries Town Centre at the darkest time of the year. Carl Watt, Head of Programmes at Arts & Business Scotland, commented: “It is wonderful that Jardine Funeral Directors is supporting D-Lux Festival for a third consecutive year, once again receiving funding support from our Culture & Business Fund Scotland. Their creative partnership not only brings back the unique D-Lux Festival for the people of Dumfries to enjoy but also makes a significant contribution to the creative regeneration of the local area.